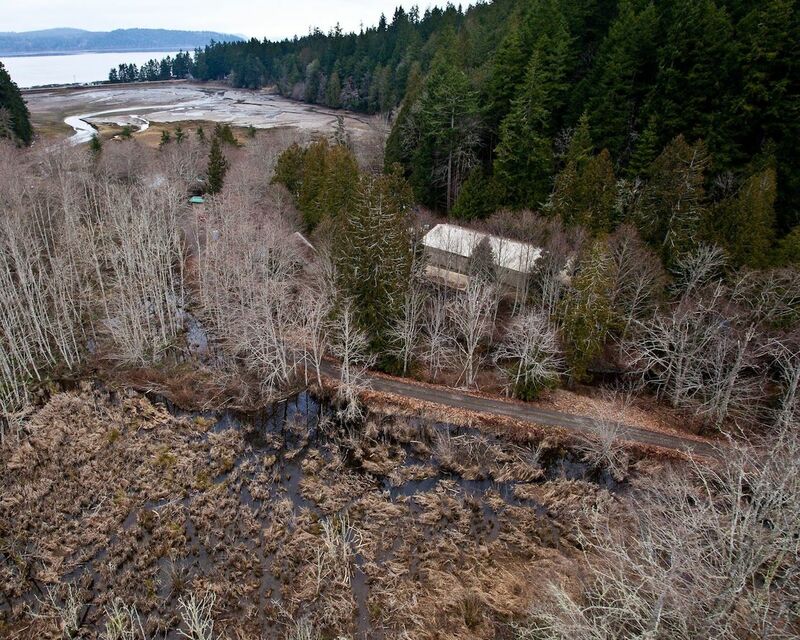 Big Beef Creek, which flows into Hood Canal near Seabeck, will soon undergo a major wetland renovation that should improve the survival of coho salmon and steelhead trout. Other work, which started last year, involves placing large woody debris in the stream to create deep pools for salmon to cool off and rest before continuing their migration. The wood also will help to form new spawning areas for coho, fall chum and the threatened summer chum of Hood Canal. 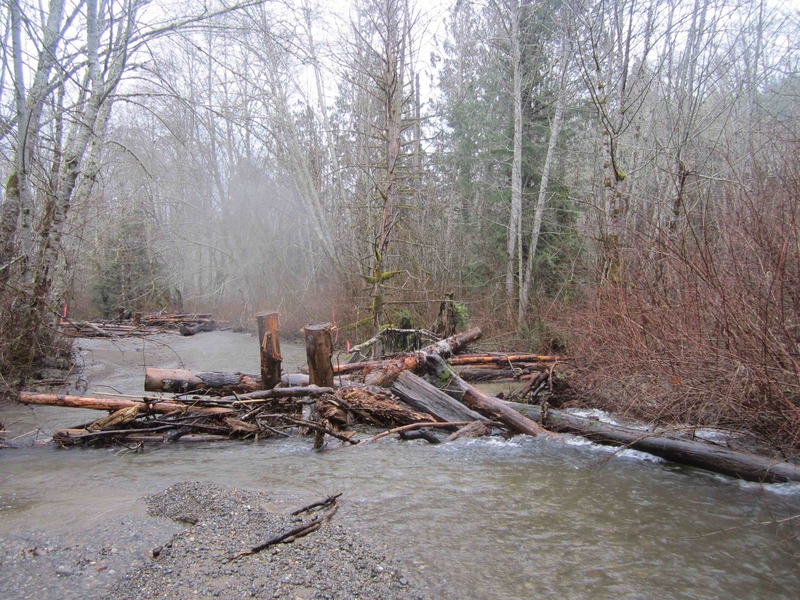 Large woody debris placed in Big Beef Creek last summer has begun to form pools where salmon can escape the strong current. Big Beef Creek is an unusual stream, one with a personal connection for me. In the late 1970s, I lived at Lake Symington, a man-made lake built years before by impounding Big Beef Creek. A few years ago, my wife and I bought a home with a tiny tributary of Big Beef Creek running through the property. To get a lay of the land, I ventured along the stream and through the watershed in 1999, meeting many people along the way and gaining a new respect for Big Beef Creek — known as the longest stream contained entirely within Kitsap County. Check out my story for the Kitsap Sun called “The Watershed.” Much later, I wrote a Water Ways blog post about the creek beginning with, “It is the best of streams; it is the worst of streams,” with apologies to Charles Dickens. Today, the $1.2 million habitat transformation is taking place in the lower portion of the stream, just upstream from the estuary where people go to watch bald eagles soar. (Check out this week’s “Amusing Monday.”) The project is on property owned by the University of Washington’s Big Beef Creek Research Station. Work is under the direction of Hood Canal Salmon Enhancement Group, a division of Pacific Northwest Salmon Center. Site work will expand an 11-acre wetlands by five acres and reconnect the wetland complex to the stream channel. Coho, which remain in freshwater for the first year of life, will find a safe place to stay during the low flows of summer and the fierce floods of winter. Officials have agreed to close the well, so a relocated road will not be needed. 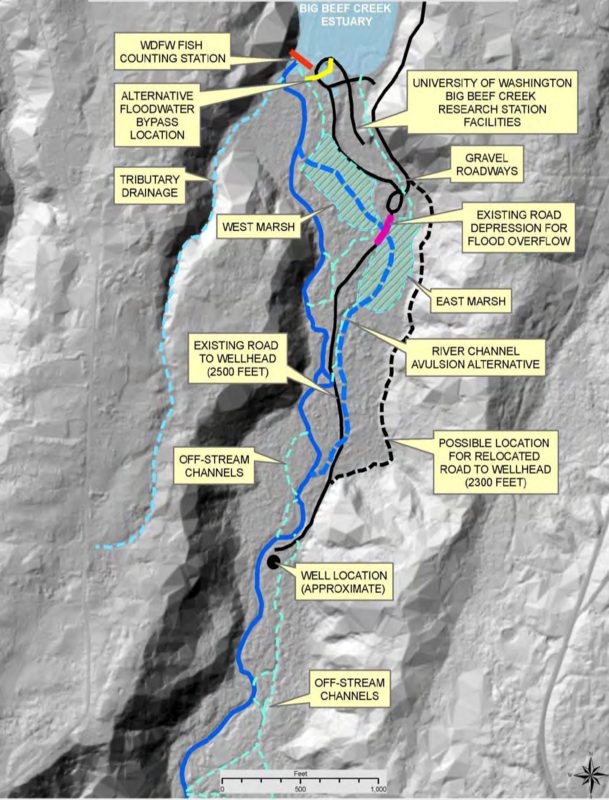 Note the off-stream channels and ability of the stream to change course within the floodplain. Removing an access road along with 1,600 cubic yards of fill will restore two of the five acres of wetlands and open up the floodplain. The other two acres come from excavating some 4,500 cubic yards of fill from an elevated area where old storage buildings were removed last year. 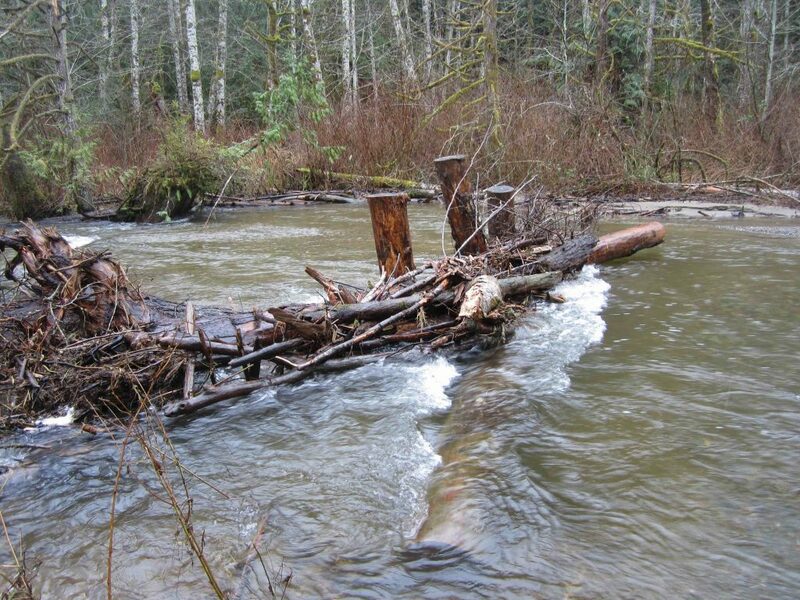 In last year’s work, 10 man-made logjams were created where excavators could reach the creek. At the end of this month, helicopters will be used to place another 13 logjams in sections of the stream that could not be reached by land. In a coordinated fashion, the helicopters also will be used to place logjams in Little Anderson Creek, which drains into Hood Canal just north of Big Beef. Little Anderson Creek, which originates near Newberry Hill Heritage Park, previously received several loads of wood in 2006 and again in 2009. Both Big Beef and Little Anderson are part of an “intensively monitored watershed” program, in which experts are attempting to measure the extent to which habitat improvements increase salmon populations. It is not an easy thing to figure out, since salmon runs vary naturally from year to year. Still, over time, the improved spawning and rearing conditions should be measurable. 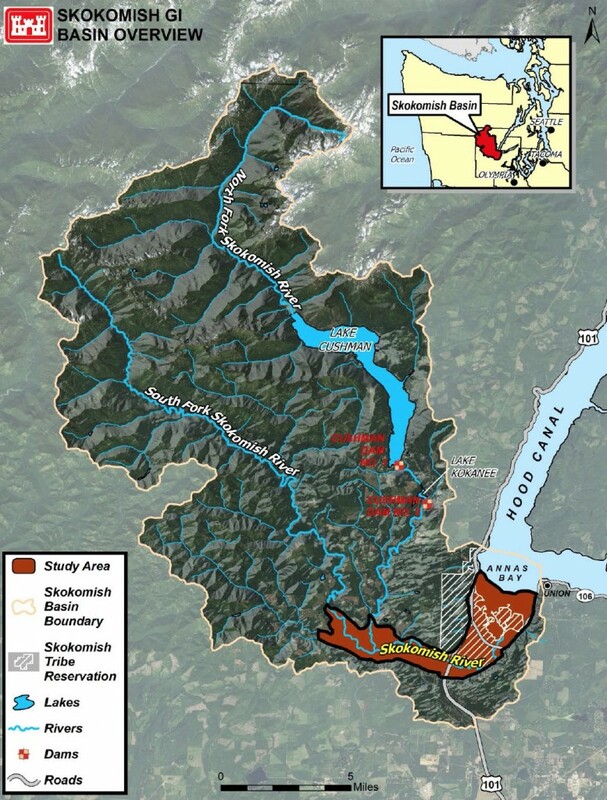 Other restoration work is planned on Seabeck Creek, while Stavis Creek will remain unchanged as the “control stream” for the Hood Canal complex of intensively monitored streams. Fish traps placed in the streams monitor the out-migration of young salmon smolts, while a permanent fish trap at Big Beef Creek is used to count both smolts and returning adults. For each stream, biologists also count the number of redds — mounds of gravel where salmon have laid their eggs — to determine if conditions are improving. Adding wood to Big Beef Creek results in greater stream complexity, offering salmon options for food, spawning and other needs. The improved wetlands and floodplain on Big Beef Creek will allow the stream to move among several historical stream channels as sediment loads build and decline over time. Strategically placed wood will provide complexity wherever the stream chooses to go, according to Mendy, who has been working toward this project since 2007. Sarah Heerhartz, habitat program manager for Hood Canal Salmon Enhancement Group, said improving the wetlands will not only help fish but also birds that favor wetlands. The stream will have room to move and spread out, she said, and some of the sediment from upstream sources will drop out before reaching the estuary. “The floodplain is going to be a big boost for coho fry to smolt survival, because that will open up a lot of rearing habitat for juvenile coho,” Sarah told reporter Ed Friedrich in a story written for the Kitsap Sun. 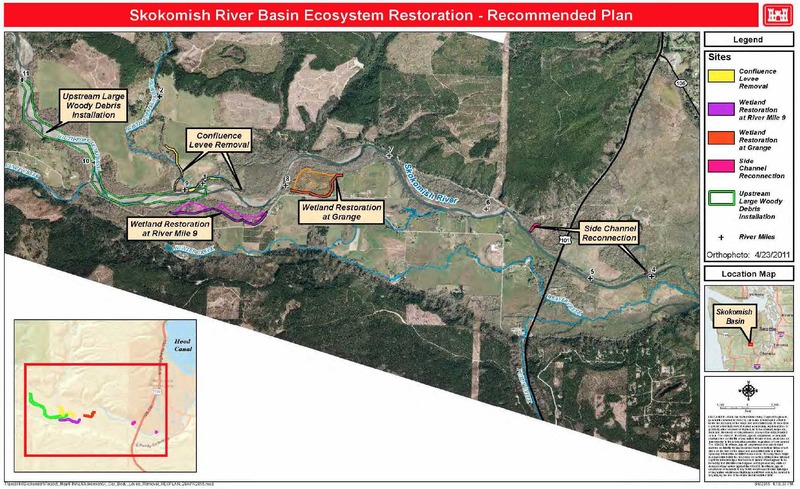 The stream restoration is not expected to affect work at the UW research station, which continues to play a role in salmon studies, including efforts to improve hatchery conditions. In 1999, I wrote about the efforts to restore a run of summer chum on Big Beef Creek. Take a look at “Reviving a salmon run.” Unfortunately, the resuscitation effort has not been entirely successful, but there are new hopes that this summer’s stream repairs will give a boost to the summer chum as well as the coho.